They are picked, carved, scooped, and put out on the front porch with a candle inside as a Halloween festivity. But what people may not know is that pumpkins are actually a highly nutrient dense food. Rich in vitamins and minerals but low in calories, pumpkin seeds, juices, and even the leaves are packed with tons of powerful nutrients. Pumpkins are one of the best-known sources of beta-carotene, a powerful antioxidant. Our bodies convert any beta-carotene into vitamin A. Consuming foods that are rich in beta-carotene may reduce your risk of developing certain types of cancers, delay aging and body degeneration, and provide protection against heart disease and asthma. Studies have suggested that eating more of plants such as pumpkins can decrease your risk of becoming obese. It can also provide help in preventing diabetes, heart disease, and even promote healthy complexion and hair. 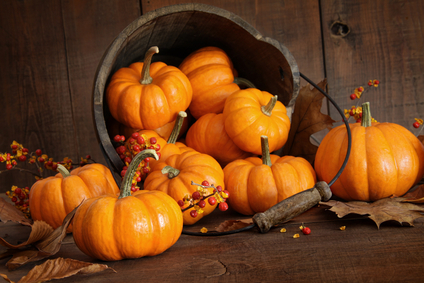 Pumpkins are an excellent source of fibre and boosts energy, and a healthy body mass index. Incorporating pumpkin into your diet can be as easy as throwing some pieces into your morning smoothie. But before you pick one up, know what to look for in a good pumpkin. Make sure your pumpkin has a few inches of stem left and that it is hard and heavy. Uncut pumpkins can be stored in a cool, dark place for up to 2 months. This time when pumpkin season comes around, don’t just carve them up, cook them up and enjoy the amazing benefits!